Fifth and final post of the day - the last of the Models Own Splash polishes swatches. This one is Aqua Splash, a pretty turquoise flakey. 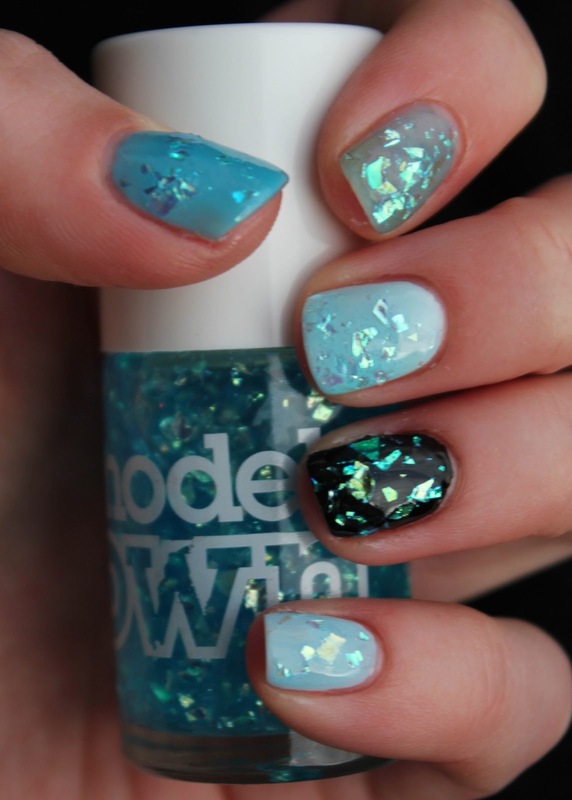 Like the Mermaid Tears, it looks stunning in the bottle - but just doesn't have much colour in the base of the polish, so it looks best over a coloured base. Again, formula is just like the other splashes. Again I put it over various colours - which I've labelled on the photos below. 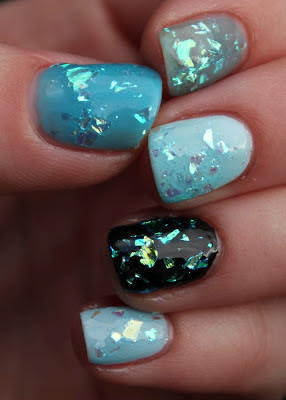 On all but the naked nails I used two coats of Aqua Splash. The neon blue was Models Own Hed Kandi Balearic Cool, naked was nothing on my nail, white was Models Own Snow White, black was Models Own Black Magic, baby purple was Models Own Blueberry Muffin. Yet again I think it shows up the best and prettiest over the black base. 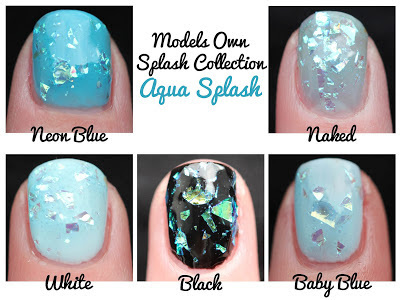 Click here for Red Sea, here for Golden Shore, here for Pink Paradise and here for Mermaid Tears swatches. So, now all the swatches are up - which is your favourite? Thanks so much - glad you liked it! Coming to think of...do you have Models Own 'Snowflakes'?? I don't - but I've been looking at it for a while and may well get it for the winter! !